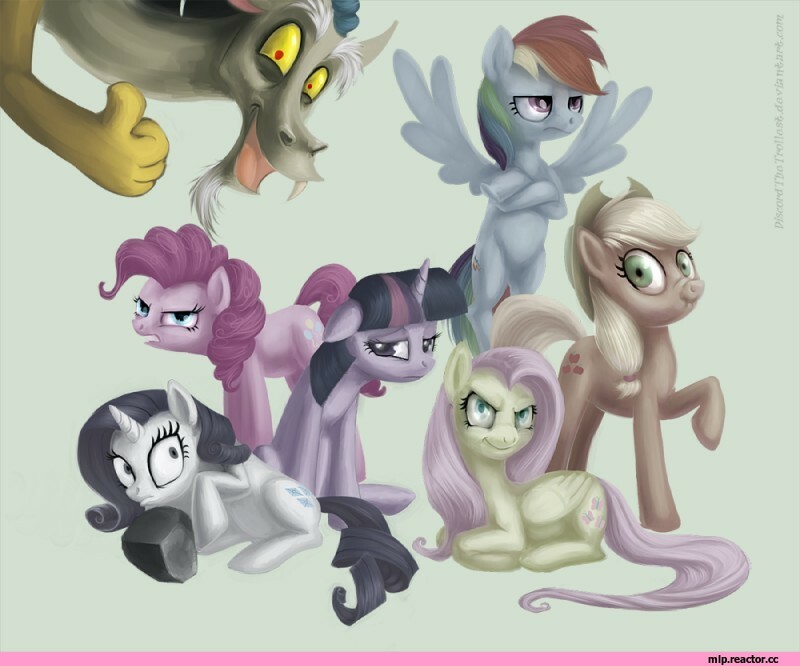 Welcome Everypony, to the Discord Fan Club! 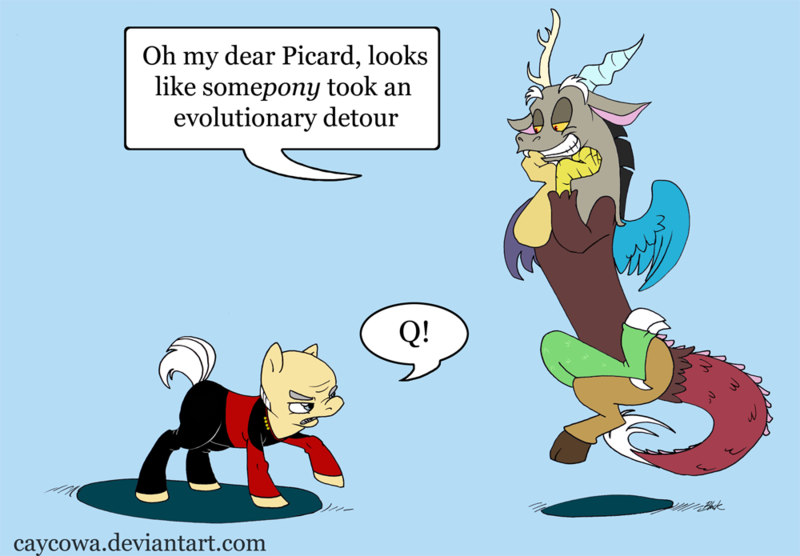 Here, we will show our appreciation and admiration for one of the best villains of all time: John De Lancie's Q, er..I mean, the Spirit of Chaos! 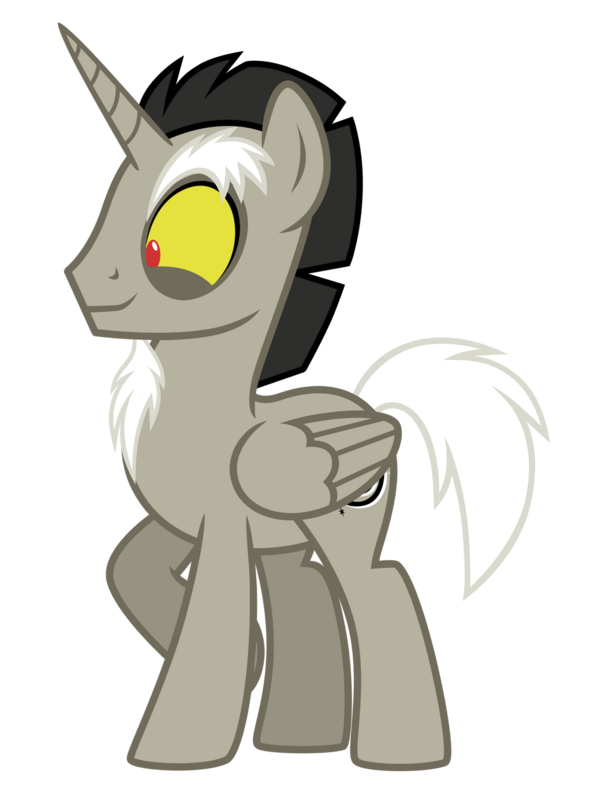 Discord: *Yawn* Enough talk. Let's get chaotic, now. 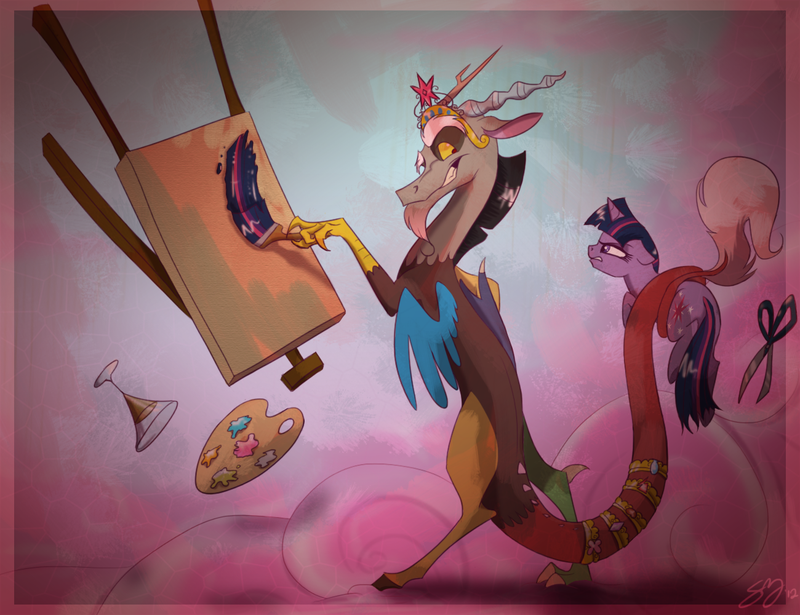 Discord: What?! You mean there are rules in a thread about Chaos?! Me: Ummm...yes, as ironic as it sounds, there are. ☆ Please keep in mind what Fan Club this is. So please, don't make a Princess Luna post, for instance, unless it has Discord too. ☆ Bear in mind that there are younger ones out there! No NSFW content is allowed. ☆ This is a Fan Club, not Hate Order. 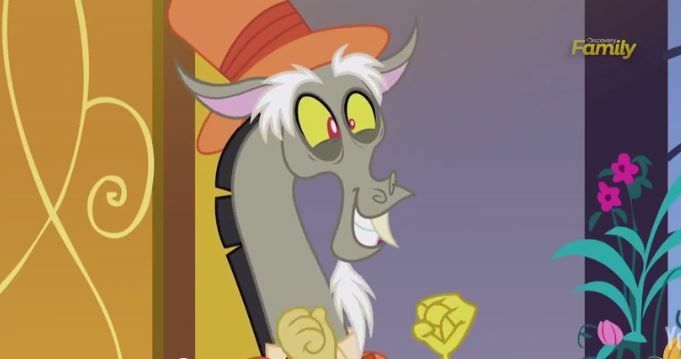 If there is something not-exactly-nice you have to say about this place, Discord, or virtually anypony or anything, then please keep that at bay. Now let's get the chaos rolling! 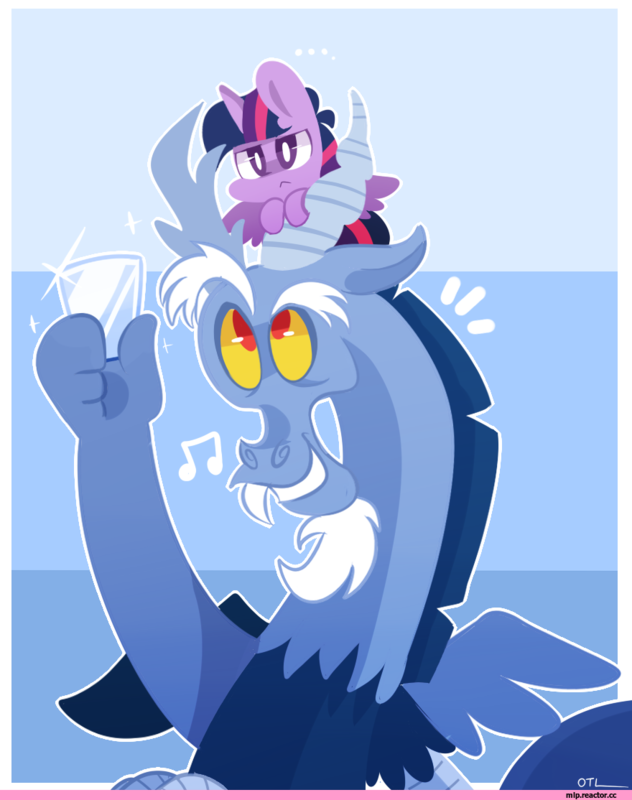 I remember you really liked this picture of Discord and filly Celestia. 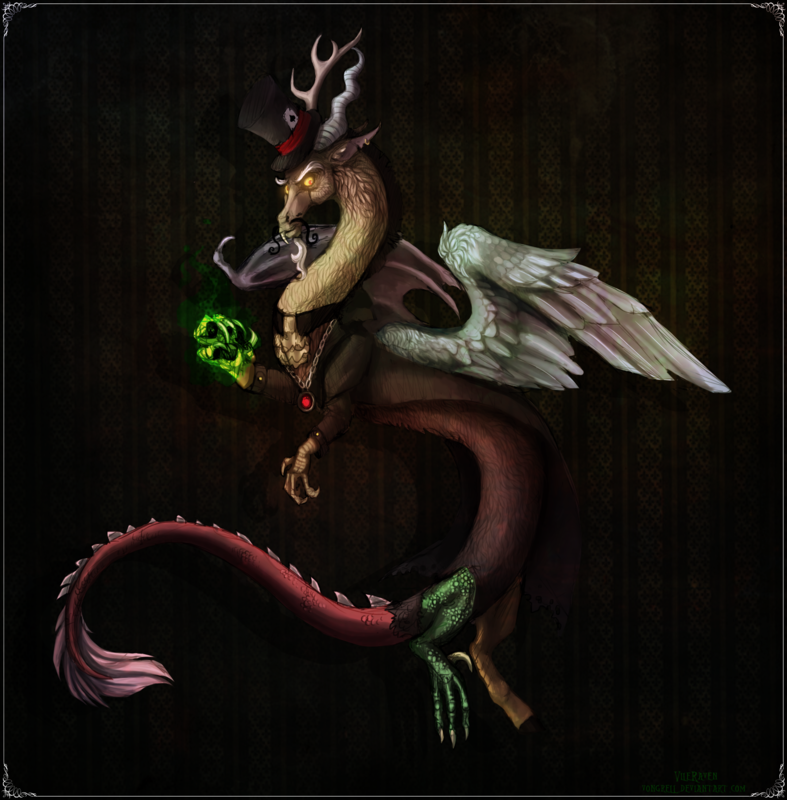 Discord is one of my favorite MLP villains, I personally find him hilarious. You'd think Spirit-Of-Chaos-endorsed products would sell at least a little more than that, but oh well. 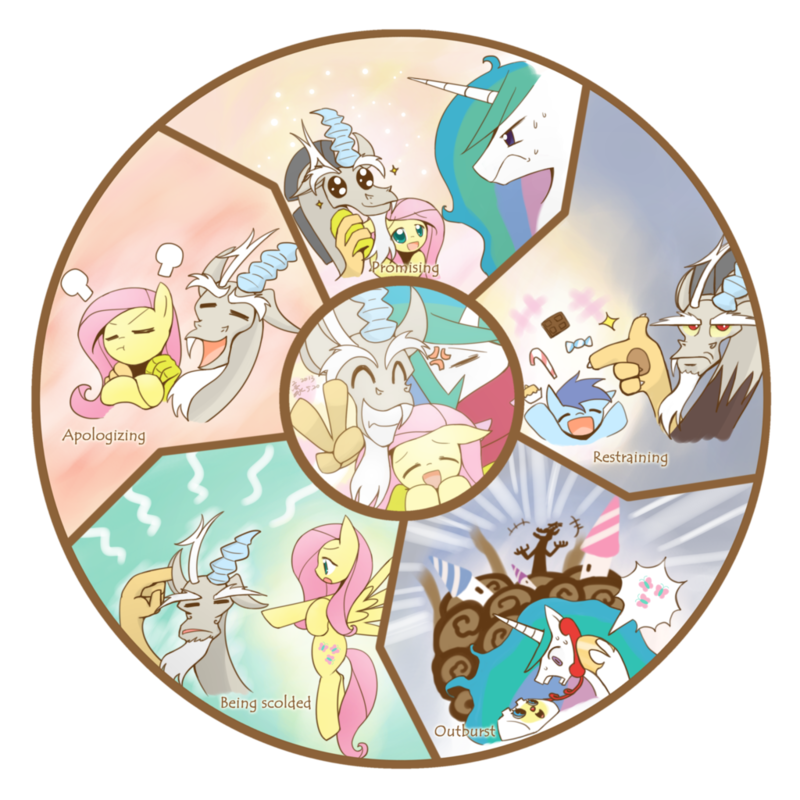 This IS one everlasting FlutterCordLestia circle! 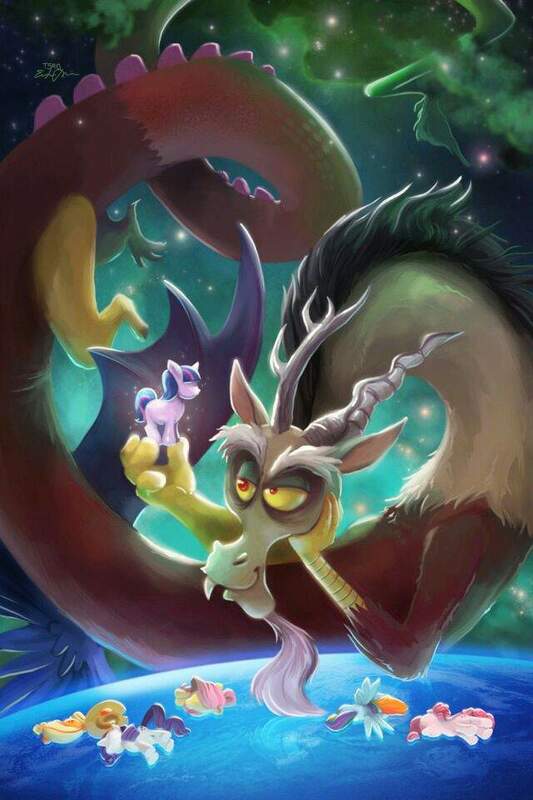 Since we've been discussing "Beauty & the Beast" I thought this Discord and Celestia would be appropriate. And since we both posted "Toy Story" related MLP videos here's Discord & Celestia as Sheriff Woody & Bo Peep. Personally, I don't like Celestiacord or Fluttercord. Feel free to post them, though. 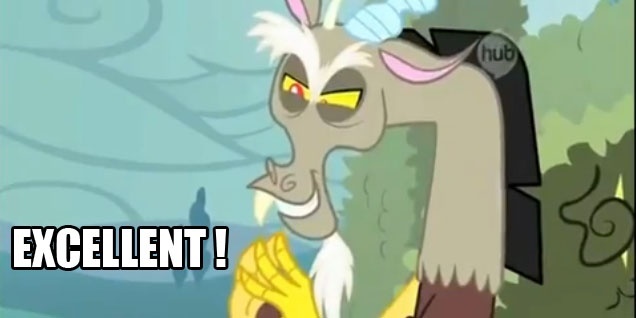 I'm not a fan of shipping Discord with anyone to be completely honest. I just posted those because, they sort of went along with what we were talking about earlier. Whoa, nice Light Saber Discord! 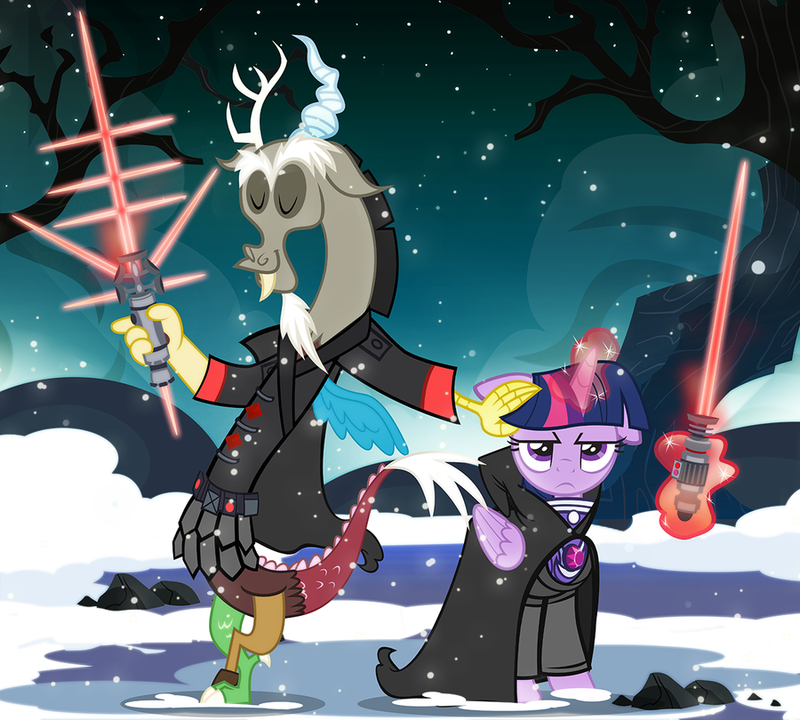 Although...I suspect that even Darth Maul and General Grievous would call that cheating. 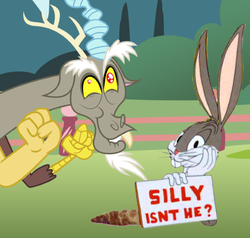 I don't think Discord would really care about whether he cheated or not, as this picture clearly shows. 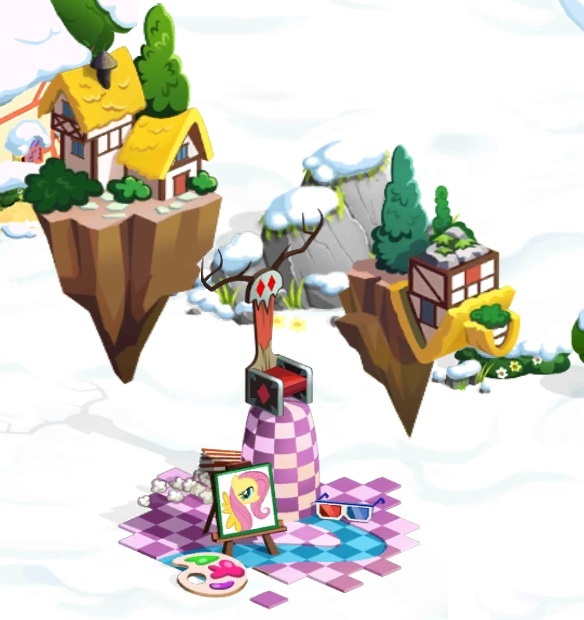 Discord: "The one on the left is a guest-house; I sleep in the upside-down one on the right. Why? Because right-side-up is for noobs." 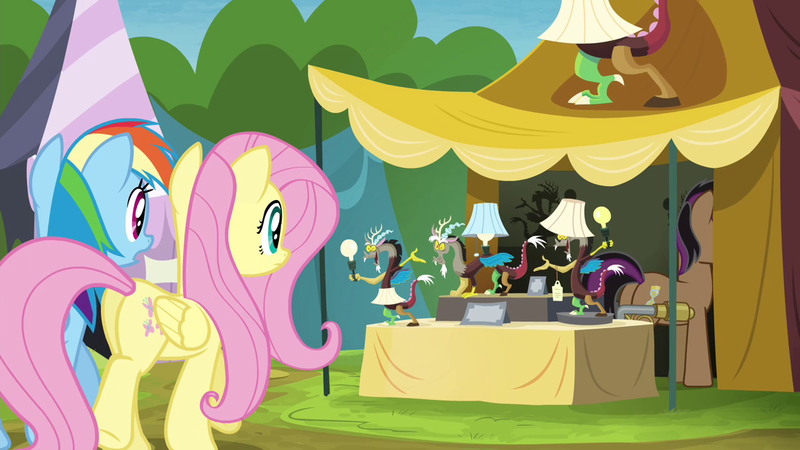 Remember that line in "Princess Twilight Sparkle (Part 2)" (I think that's the right episode...) about how Discord doesn't do windows?